Also known by her Yiddish name, Tobe, Terez was raised in a religious Jewish family. Her father and two brothers were rabbis. Though Terez was a promising student, she didn't pursue an advanced education because her traditional family wanted her to marry. So Terez married Menyhert Katz and moved to the town of Kisvarda [in Hungary]. There, she raised five daughters and one son; two other sons died. 1933-39: Terez's twin sons died when they were 8 months old, and she was convinced that their death was a result of the antisemitic malevolence on the part of the hospital staff. She wanted to immigrate to the United States, but her religious husband considered it too secular a country. After two years, Terez persuaded her husband to try and obtain immigration papers for the family. 1940-44: By the time the visas came through, Hungary was at war with America. 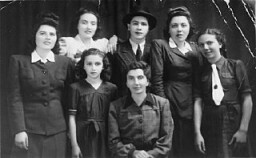 In April 1944 Terez and her children were moved into Kisvarda's ghetto. On May 28 Hungarian gendarmes, supervised by Germans, ordered them to be ready to travel at 4 a.m. the next day. Terez bought what food she could find--even ham forbidden by Jewish law--because no one knew the destination or length of the trip. Terez distrusted the Nazis who said they would be treated well, but felt good would prevail and urged her children to survive. Terez was gassed when she arrived at Auschwitz on May 31, 1944. She was 50 years old.